Geek Vape is one of the hottest atomizer brands in the industry right now. Their original Griffin RTA has received a lot of praised from the vaping community, as have all their other offerings, like the Avocado Genesis and Tsunami RDA. The Chinese company has recently released a new Griffin, called the Griffin 25, which comes with higher e-juice capacity and bigger building deck, among other improvements. 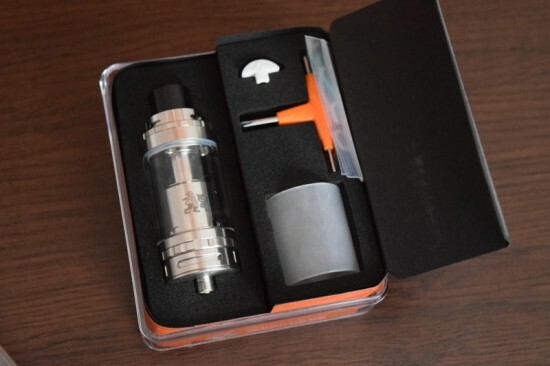 The Geek Vape Griffin 25 Top Airflow RTA kit comes in a clear plastic box with a foam holder for the tank and a thin cardboard side cover over the included accessories (a spare glazed glass tube, a ceramic plug for single-coil vaping, a special three-in-one screwdriver for Velocity-type decks, a 510 drip adapter to use with regular drip tips and a bag of spare screws and O-rings). The one thing that’s missing, in my opinion, is a user manual. 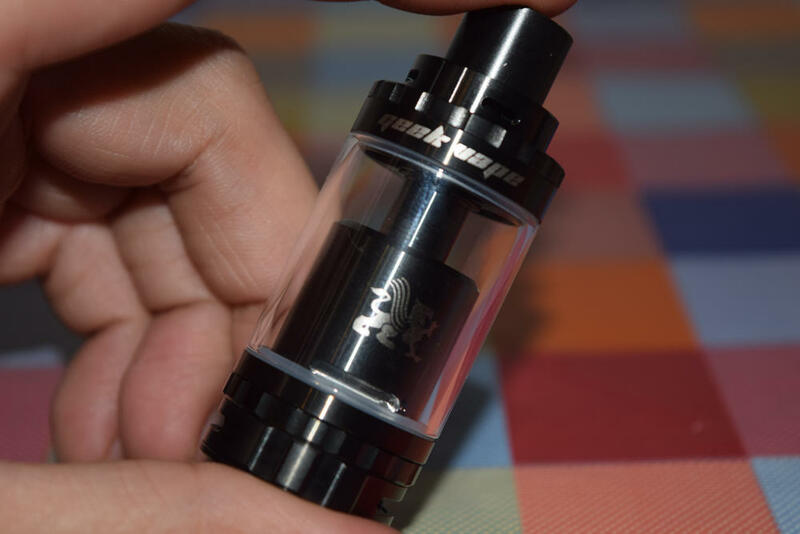 The Griffin 25 is not the simplest atomizer to use, even for advanced users, and I for one have had to check a few online videos to figure out some things – like how to remove the preinstalled ceramic plug in order to do a dual build. I feel that providing a basic user manual is a must with this kind of advanced devices, and hopefully Geek Vape will include one with future iterations. The Griffin 25 is one of the largest tanks I have ever used. 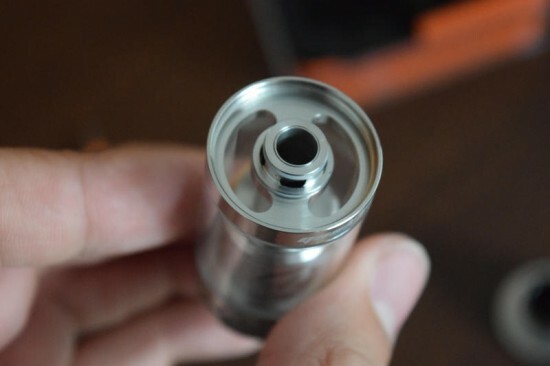 As the name suggests, it is 25mm in diameter – technically, it’s 24mm at the base, but opens to 25mm at the juice flow adjustment ring – and 54.4mm in length, excluding the 10mm drip tip. This thing is huge, but while it may not be the most portable atomizer out there, the large size does have its advantages. The new Geek Vape flagship holds up to 6ml of e-liquid, and has a massive 17mm build deck that’s super easy to work with and accommodates large diameter coils with ease. 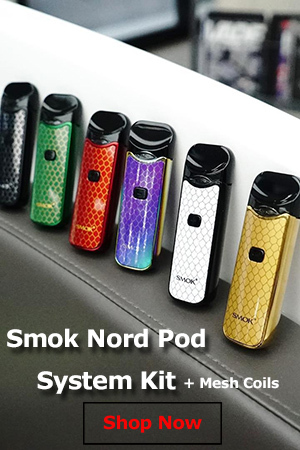 It will fit great on large dual-battery mods like the SMOK H-Priv or the Vaptio S150, but it most likely overhang a little on smaller single 18650 devices. For reasons that are unclear to me right now, Geek Vape released two versions of the Griffin RTA – Standard and Top Airflow. 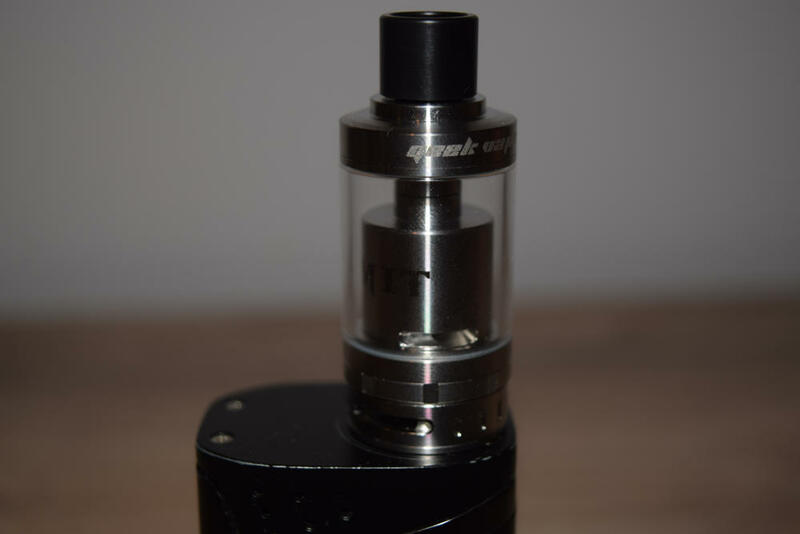 Apart from the drip tip airflow system on the latter, the differences between the two are minimal, so I don’t see the point of the standard tank. 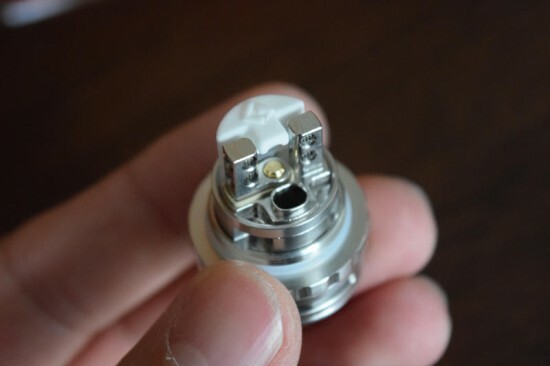 Closing off the air slots under the drip tip completely essentially turns the top airflow tank into a standard one, so why have come up with two different types. Anyway, I received the Top Airflow Griffin 25 for this review, and if faced with the choice, I suggest you pick it over the standard version. Right out of the box, it’s clear to see why Geek Vape has built such a great reputation among vaping enthusiasts. The design and machining are flawless, and the tank just has a sturdy quality feel to it. Both the bottom and top airflow rings turn smoothly and protrude from the tank to make them easier to turn, and there are no sharp edges, either on the stainless steel parts or the glass tanks. Everything is smoothed out. Starting from the top, we have an over-sized delrin drip tip that allows for a very airy vape, which direct lung hit fans are sure to appreciate. 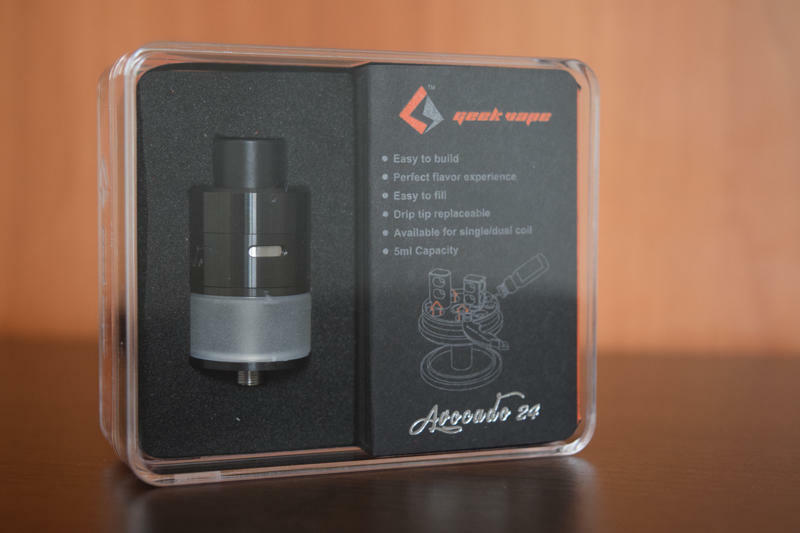 If you prefer a tighter draw, Geek Vape has you covered, as the Griffin 25 comes with an adapter that lets you replace the over-sized drip tip with a standard one. Right below is the top airflow system, which is basically the same as the one SMOK introduced on their original TFV4 sub-ohm tank – four small air slots that can be opened or closed gradually by rotating a metallic ring. I for one prefer to keep them closed at all times in order to maximize flavor, but you can toy with it if you like. This feature is only available on the Top Airflow version of the Griffin 25, not the Standard one. 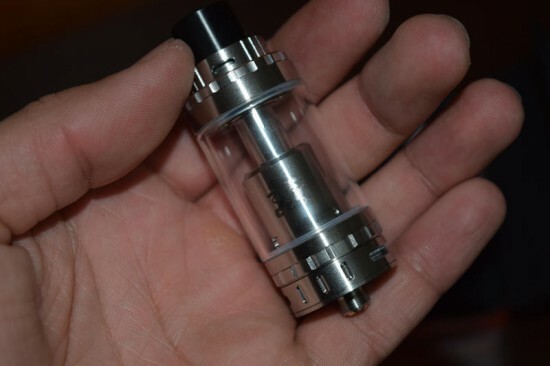 The top part of the tank unscrews from the glass tube to reveal two massive juice filling slots that can accommodate virtually any size dropper or juice bottle, so refilling this thing is not going to be an issue, ever. The Griffin 25 comes with the clear glass tube preinstalled, but you can always change it with the included glazed glass one if you like the look more, or if you accidentally crack it. Inside the tube, we have a double-walled chimney, 9mm in diameter, through which massive amounts of vapor travel from the base into your mouth. Right bellow, we have the bell-shaped cover of the Velocity-style building deck – probably the most important part of the tank – with four big juice flow control slots. Finally, in the lower section we have a dented juice-flow control ring that you can turn clockwise to close the juice slots and anti-clockwise to open them, and two massive airflow holes that can gradually be opened and close by rotating a metal ring. I prefer to keep these wide open for maximum vapor production. Before we talk about how the Griffin 25 performs, I really have to mention the awesome Velocity build deck. 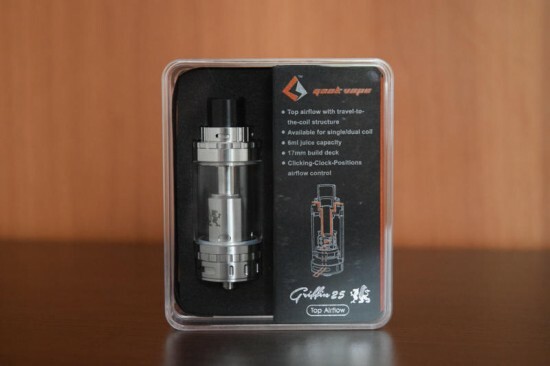 First, you should know that the Griffin does not come with preinstalled coils, so if you don’t have any experience building your own coils, you should consider another option, or at least buy some pre-made coils beforehand. That said, building on this thing is a breeze. The four holes on the two parallel posts allow for single coil, dual coil or quad coil setups, and are massive enough in diameter to accommodate virtually any type of wire, from standard gauge to Clapton or Alien wire. Coils can be oriented horizontally or vertically, depending on your preference and building skills, and even large diameter ones easily fit into the stainless steel cover of the tank without touching the walls. Last, but not least, the base provides great airflow thanks to a couple of massive holes located right under where the coils sit, pushing in air from below, thus amplifying the flavor of the vapor. It’s without a doubt the best RTA base I have ever tried, and there have been a few. I’ve never been a big fan of allen head screws, but they are actually required on the Velocity-style deck of the Griffin 25, to make sure they don’t come in contact with the stainless steel cover of the deck. Plus, the handy 3-in-one screwdriver included in the kit is quite handy. Since I didn’t have a lot of experience working with Velocity-style decks apart from the much smaller one of the SMOK TF-RDTA, which also has a significantly different design, wicking the Griffin 25 proved to be somewhat of a problem. This was one of the cases where a user manual would have really come in handy (I hope you’re reading this, Geek Vape). First of all, the deck is fixed to the bottom part of the RTA and can only be detached by unscrewing the 510 connector pin. The only removable part of the deck is a small metallic ring that goes around the four wick slots – and I only found this out after watching a how-to video on how to remove the pre-installed ceramic plug on one of the sides. Yanking it out didn’t seem to work, but I couldn’t see any other way. This metal ring unscrews very easily, but without a manual, I had no idea it was removable. Anyway, back to the wicking. I made the mistake of using thinner strips of cotton than necessary, which didn’t completely cover the wicking slots, which resulted in some serious leaking, the first time around. I really can’t blame the tank, but at the same time, I’m not comfortable taking responsibility for something I really didn’t have any experience with. Had I had some basic instructions, this would never have happened. Watching the how-to video was a real eye-opener, and leaking was not a problem the second time I wicked it. If you’re not familiar with Velocity-style decks, I recommend you watch a YouTube video on how to properly wick this type of deck, in order to avoid making a mess and wasting perfectly good e-liquid. Performance wise – ignoring the incident described above – the Geek Vape Griffin 25 is beyond impressive. 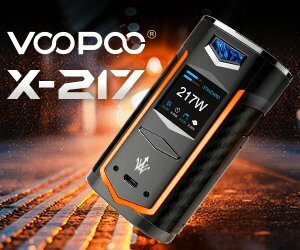 This thing puts similar-size tanks like the SMOK TFV4 or UD Simba to shame, both in vapor production and flavor. I’m currently using it with a dual-coil build (0.16Ω Tiger wire) and it is absolutely phenomenal. At just 80W, a single draw is all it takes to literally fill my room with dense vapor that slowly drops to the ground. It is by far the most impressive RTA I have ever used, in terms of vapor production, but really the most impressive thing about the Griffin is the flavor it puts out. The design of the Velocity-style deck with the bottom air holes right under the coils plays a big part in this, but I really have to commend Geek Vape on the overall design of the Griffin 25. I have no problem saying that this tank is on par with the best RDAs when it comes to flavor. I really can’t explain how intense the flavor is, you just have to try it for yourself. 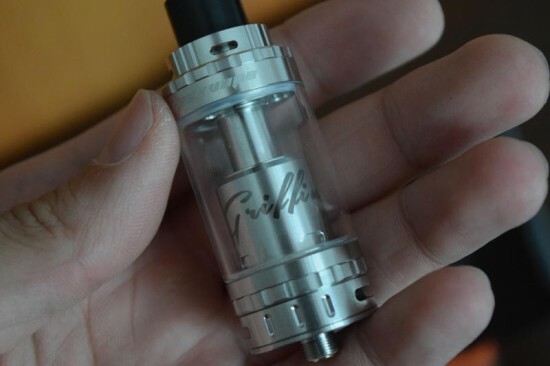 If you’re looking for the ultimate RTA on the market right now and have no problem with its considerable size, you’re going to have a tough time finding anything better than the Griffin 25, especially for the unbelievable price of $39.99. I really can’t recommend this tank highly enough! The Griffin 25 RTA was sent to me by Heaven Gifts for the purpose of this review. Great review! I just bought one and cant wait to test it out this evening. Nice device, horrible support. I bought an original and lost the chimney. Geekvape refused to even sell me a replacement chimney without the verification code on the box. Who f***ing keeps their boxes? Their excuse was that it was because too many companies counterfeited their products. Punishing your real customers to stop counterfeiters is ridiculous. Buy yourself a clone, at least you won’t be out a lot of money if you lose or break a part. How u contact geek vape, to buy the spare part? I have avocado 24, and i not intentianally drop the cap, and its bend, i want to buy the part, howw to buy it?